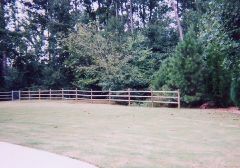 This traditional wooden post and rail fence separates the lawn from the wooded area. A farm fence of this sort is great for cows, horses and goats. You use wood post or steel T posts. 3, 4 or 5 board fence is great for open space, ranch and farm. Miles of beauty lets you know you are close to home.